This new money will replace the old swing set that was destroyed by termites and they have received great support from community groups including the Heathcote and District Community Bank, the Heathcote Lions Club and Mandalay who we would all like to sincerely thank. They also held a raffle for many local businesses and their support has been instrumental in getting the project across the line, in particular the Heathcote and District Community Bank branch manager Michael Prowse who said they had contributed $2000 towards the new swing set. This cookbook has more than 20 different family recipes which are considered special and unique favorites and some have been passed down from many generations such as the Gran Touhey’s apple cake slice. It costs only $10 and we urge people to go any buy one of these books to support this worthy cause – So what are you waiting for? Head down to Heathcote and District Community Bank and get yours today! 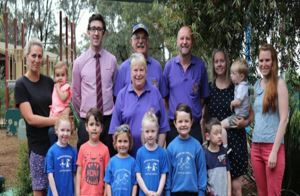 Posted in Media Stories and tagged Heathcote and District Community Bank, Heathcote Kindergarten’s Cookbook, Kindergarten cookbook funds play equipment.